Thanks, Church Tech Today for the interview with the founder of Simon Solutions, creators of CharityTracker and Oasis Insight! 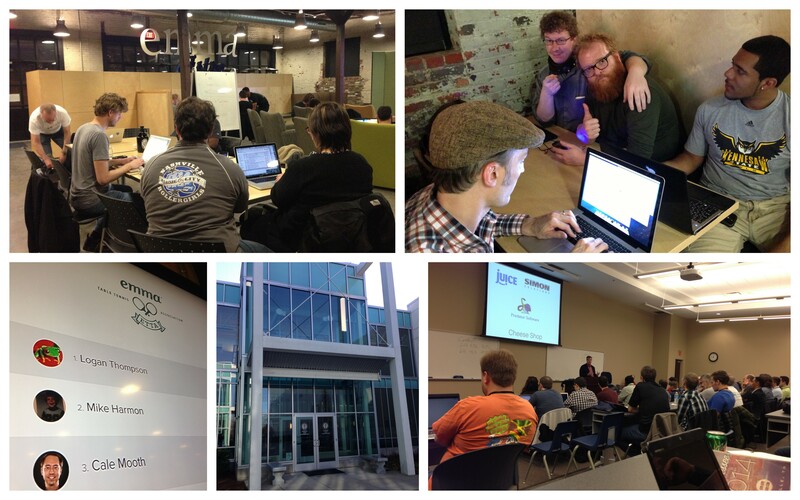 This past weekend, Simon Solutions was a proud sponsor of PyTennessee 2014, a conference in Nashville, TN for the popular computer programming language, Python. Python is an open source language used by our programmers as well as industry heavyweights such as Google, Yahoo, Mozilla and thousands of other companies. The Simon Solutions development team was also very happy to have the opportunity to attend PyTennessee 2014 themselves. The enthusiasm and diversity of attendees was mesmerizing. There were coders from all over the United States and even a classroom full of children anxiously setting up their computers to learn programming. During the keynote, Nashville's mayor, Karl Dean (pictured below), expressed his gratitude and excitement of seeing Nashville's tech community growing by leaps and bounds. After each day of the conference, Emma, a Nashville-based email marketing company and co-sponsor of the conference, hosted sessions where programmers could contribute to the open source community in a group setting. Open source software is generally free for anyone to use and is maintained by programmers from all over the world. Without a doubt, the internet wouldn't be what it is today without open source software. Needless to say, we can't wait for PyTennessee 2015! A very special thanks to Jason Myers and his team for organizing an awesome conference! Hi there! This is Isaac Simon, the Chief Technology Officer here at Simon Solutions. Occasionally, I'll be sharing helpful tech tips and tools that can hopefully enhance the way you and your organization do what you do so well, reach out to those in need. The problem is that many of the web meeting products available require cumbersome steps to start or join an online meeting. Too many features, too many options, too much trouble! With join.me the presenter (and only the presenter) downloads a small application, then sends all attendees a link to join the meeting. Here's where it shines - The attendees click a link from an email and they're in, looking at the presenters screen. No software download, no headaches. Attendees can access the web meeting via their desktop, laptop, iPhone, iPad or Android from wherever they are. In their words - "join.me combines instant screen sharing and powerful meeting tools in an app that anyone can use to present, train, demo or concept. join.me is designed to be intuitive and accessible, providing features that you'll use every day for everything from show-and-tell to formal presentations." You can check it out for free at join.me. Simply click "start meeting". If you love it and choose to upgrade to the pro account (meeting recordings, up to 250 attendees, custom web address and more) they offer discounted non-profit pricing. The video above does an excellent job of introducing you to the concept of one of my favorite services, Dropbox. Imagine never having to email yourself files so you can work on them at home, imagine easily sharing a large folder of pictures and video with someone in just a few clicks, or most importantly imagine having your files backed up and always available no matter where you are! Dropbox is a folder on your computer that automatically syncs everything inside with all of your computers, phones, tablets and a secure password-protected web site. You could start writing a grant proposal at the office, finish it at the house, and show it to potential funder the next day at lunch. And all the while you never had to email yourself the file. When you clicked "Save" at your house, the file was automatically updated on your office computer and your smartphone! Dropbox can also make collaboration a breeze. Let's say you and a colleague need to work on a presentation together, you just create a folder and enable folder sharing. Your teammate will get an email invitation to the folder. Then, when either one of you add or make changes to a file in that folder, you'll both stay perfectly in sync. The examples are endless. I have yet to find someone who has tried Dropbox and didn't fall head over heels in love. It's super easy-to-use and free. If you want to store a large amount of files, they have a paid tier which I think is totally worth it, but you can make that decision for yourself. Make your life easier and check out Dropbox. This post is part of a series of technology tips presented by Isaac Simon, the Chief Technology Officer at Simon Solutions.